PETRONAS Lubricants International Sdn. Bhd (PLI) is a global oil lubricant business with operations in more than 20 countries worldwide, which includes manufacturing, marketing and distribution of high-end lubricants, transmission, anti-freeze and functional fluids for automobiles, motorcycles, trucks, agricultural tractors and earth moving machinery as well as for other industrial equipment. Commanding a global sales volume of about 625 million liters, PLI is also ranked amongst the top 15 lubricant companies globally. The company manages well over 30 different brand names and categories among them, Syntium, Sprinta, Selenia, Urania, Paraflu and Tutela to name a few; premium products brands like Syntium, are even specifically engineered using race-proven Formula One technology developed through PETRONAS’ longstanding involvement in motor sports. Our products are positioned in the high value-added segment with sales arising from innovative semi-synthetic and synthetic lubricants. PLI also maintains technical and commercial relationships with several major OEM partners worldwide. 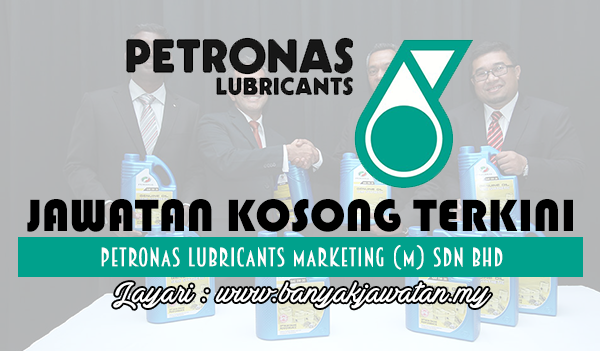 0 Response to "Jawatan Kosong di PETRONAS Lubricants Marketing (Malaysia) Sdn Bhd - 13 April 2017"